‘Tiramisu’ comes from Italian and means "pick me up". Originating in Italy in the 1960’s Tiramisu’s exact origin is disputed, but this sensational combination of fresh coffee, Marsala wine and rich, creamy mascarpone cheese is utterly irresistible. 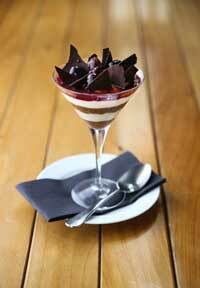 Like many Italian dishes – Tiramisu works best with high quality, fresh, ingredients. Most ingredients can be found at a supermarket, but Prego Mediterranean Foods also has all the ingredients – including the Marsala wine and Cacao powder. This recipe is provided by Luke Wearing, Comida Restaurant Chef, and he serves it on the Comida dinner/dessert menu, Wednesday through Saturday from 5:30pm. 1. Whisk the egg yolks and sugar together in a large bowl, preferably using an electric hand-held whisk, until thick and light in colour. Add the mascarpone and combine well. Set to one side. 2. Beat the egg whites in a clean bowl until they form stiff peaks, then carefully fold through the mascarpone mixture, using a large metal spoon. Set to one side. 3. Mix together the cold coffee and Marsala wine in another bowl. Dip half the sponge-finger biscuits into the mixture, being sure to soak them well, and use to line the base of a serving dish (approximately 28cm x 18cm). Pour over half of the prepared mascarpone mixture. 4. Repeat with the remaining biscuits and mascarpone mixture. 5. Place the cherries on top with a small amount of the cherry syrup. Stand the pieces of shaved chocolate between cherries, sprinkle the cocoa powder over the top using a sieve, then scatter with the grated chocolate. Refrigerate for at least 2 hours, preferably overnight.